This article comes from Tomislav Capan, technical consultant and Node.js enthusiast. Tomislav originally published this in August 2013 in the Toptal blog — you can find the original post here; the blog has been slightly updated. The following subject matter is based on the opinion and experiences of this author. This is in stark contrast to the typical web response paradigm, where the client always initiates communication. Additionally, it’s all based on the open web stack (HTML, CSS and JS) running over the standard port 80. One might argue that we’ve had this for years in the form of Flash and Java Applets — but in reality, those were just sandboxed environments using the web as a transport protocol to be delivered to the client. Plus, they were run in isolation and often operated over non-standard ports, which may have required extra permissions and such. With all of its advantages, Node.js now plays a critical role in the technology stack of many high-profile companies who depend on its unique benefits. The Node.js Foundation has consolidated all the best thinking around why enterprises should consider Node.js in a short presentation that can be found on the Node.js Foundation’s Case Studies page. In this post, I’ll discuss not only how these advantages are accomplished, but also why you might want to use Node.js — and why not — using some of the classic web application models as examples. What it really means is that Node.js is not a silver-bullet new platform that will dominate the web development world. Instead, it’s a platform that fills a particular need. And understanding this is absolutely essential. You definitely don’t want to use Node.js for CPU-intensive operations; in fact, using it for heavy computation will annul nearly all of its advantages. Where Node.js really shines is in building fast, scalable network applications, as it’s capable of handling a huge number of simultaneous connections with high throughput, which equates to high scalability. How it works under-the-hood is pretty interesting. 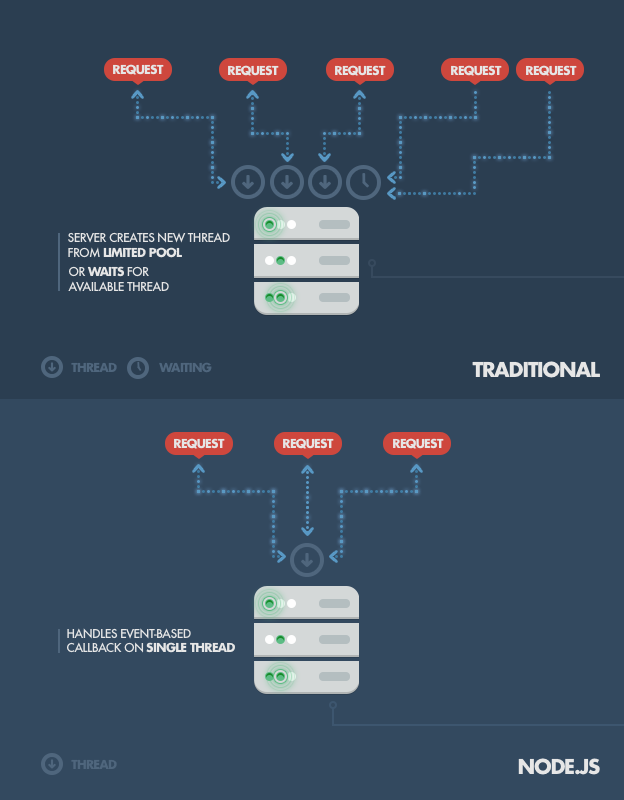 Compared to traditional web-serving techniques where each connection (request) spawns a new thread, taking up system RAM and eventually maxing-out at the amount of RAM available, Node.js operates on a single-thread, using non-blocking I/O calls, allowing it to support tens of thousands of concurrent connections (held in the event loop). *Image taken from original blog post. A quick calculation: assuming that each thread potentially has an accompanying 2 MB of memory with it, running on a system with 8 GB of RAM puts us at a theoretical maximum of 4000 concurrent connections (calculations taken from Michael Abernethy’s article “Just what is Node.js?”, published on IBM developerWorks in 2011; unfortunately, the article is not available anymore), plus the cost of context-switching between threads. That’s the scenario you typically deal with in traditional web-serving techniques. By avoiding all that, Node.js achieves scalability levels of over 1M concurrent connections, and over 600k concurrent websockets connections. The technique used to avoid exceptions bubbling up to the surface is passing errors back to the caller as callback parameters (instead of throwing them, like in other environments). Even if some unhandled exception manages to bubble up, tools have been developed to monitor the Node.js process and perform the necessary recovery of a crashed instance (although you probably won’t be able to recover the current state of the user session), the most common being the Forever module, or using a different approach with external system tools upstart and monit, or even just upstart. A full list of packaged modules can be found on the npm website, or accessed using the npm CLI tool that automatically gets installed with Node.js. The module ecosystem is open to all, and anyone can publish their own module that will be listed in the npm repository. A brief introduction to npm can be found in a Beginner’s Guide, and details on publishing modules in the npm Publishing Tutorial. express — Express.js, a Sinatra-inspired web development framework for Node.js, and the de-facto standard for the majority of Node.js applications out there today. connect — Connect is an extensible HTTP server framework for Node.js, providing a collection of high performance “plugins” known as middleware; serves as a base foundation for Express. socket.io and sockjs — Server-side component of the two most common websockets components out there today. pug (formerly Jade) — One of the popular templating engines, inspired by HAML, a default in Express.js. mongodb and mongojs — MongoDB wrappers to provide the API for MongoDB object databases in Node.js. redis — Redis client library. forever — Probably the most common utility for ensuring that a given node script runs continuously. Keeps your Node.js process up in production in the face of any unexpected failures. 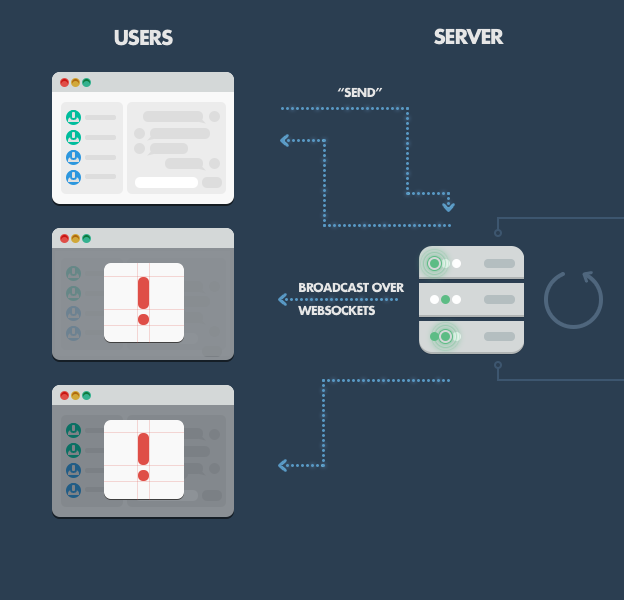 Server-side component of the websocket connection receives the message and forwards it to all other connected clients using the broadcast method. All clients receive the new message as a push message via a websockets client-side component running within the web page. They then pick up the message content and update the web page in-place by appending the new message to the board. Image taken from original blog. This is the simplest example. For a more robust solution, you might use a simple cache based on the Redis store. Or in an even more advanced solution, a message queue to handle the routing of messages to clients and a more robust delivery mechanism that may cover for temporary connection losses or storing messages for registered clients while they’re offline. But regardless of the improvements that you make, Node.js will still be operating under the same basic principles: reacting to events, handling many concurrent connections, and maintaining fluidity in the user experience. For instance, if you’re using Rails, you would convert from JSON to binary models, then expose them back as JSON over the HTTP when the data is consumed by React.js, Angular.js, etc., or even plain jQuery AJAX calls. With Node.js, you can simply expose your JSON objects with a REST API for the client to consume. Additionally, you don’t need to worry about converting between JSON and whatever else when reading or writing from your database (if you’re using MongoDB). In sum, you can avoid the need for multiple conversions by using a uniform data serialization format across the client, server, and database. Data gets queued through some kind of caching or message queuing (MQ) infrastructure (e.g., RabbitMQ, ZeroMQ) and digested by a separate database batch-write process, or computation intensive processing backend services, written in a better performing platform for such tasks. Similar behavior can be implemented with other languages/frameworks, but not on the same hardware, with the same high, maintained throughput. Image taken from original article. Another common use-case in which Node-with-web-sockets fits perfectly: tracking website visitors and visualizing their interactions in real-time. You could be gathering real-time stats from your user, or even moving it to the next level by introducing targeted interactions with your visitors by opening a communication channel when they reach a specific point in your funnel — an example of this can be found with CANDDi. Imagine how you could improve your business if you knew what your visitors were doing in real-time — if you could visualize their interactions. With the real-time, two-way sockets of Node.js, now you can. Now, let’s visit the infrastructure side of things. Imagine, for example, an SaaS provider that wants to offer its users a service-monitoring page (for example, the GitHub Status page). 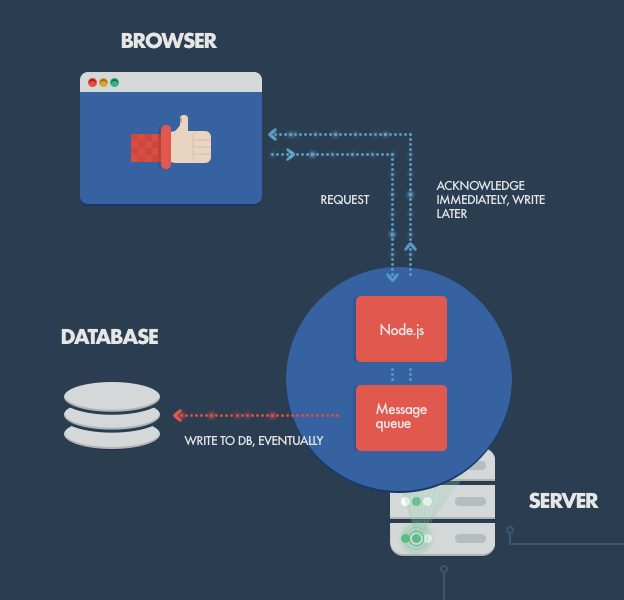 With the Node.js event loop, we can create a powerful web-based dashboard that checks the services’ statuses in an asynchronous manner and pushes data to clients using websockets. Note: Don’t try to build hard real-time systems in Node.js (i.e., systems requiring consistent response times). Erlang is probably a better choice for that class of application. Any CPU intensive computation will block Node.js responsiveness, so a threaded platform is a better approach. Alternatively, you could try scaling out the computation(*). (*) An alternative to CPU intensive computations is to create a highly scalable MQ-backed environment with back-end processing to keep Node as a front-facing ‘clerk’ to handle client requests asynchronously. Still, if you’re really inclined to remain JS all-the-way, check out Sequelize and Node ORM2. (*) It’s possible and not uncommon to use Node.js solely as a public-facing facade, while keeping your Rails back-end and its easy-access to a relational DB. As stated previously, Node.js is single-threaded and uses only a single CPU core. When it comes to adding concurrency on a multi-core server, there is some work being done by the Node core team in the form of a cluster module. You can also run several Node.js server instances pretty easily behind a reverse proxy via nginx. We’ve discussed Node.js from theory to practice, beginning with its goals and ambitions, and ending with its sweet spots and pitfalls. When people run into problems with Node, it almost always boils down to the fact that blocking operations are the root of all evil — 99% of Node misuses come as a direct consequence.